Magnar wanted to know how to calculate the length of such a spiral. There's an interesting story behind Magnar's question. He builds parabolic dish cookers in Africa. In this photo, he's helping to install one of his dishes in a village. The dish concentrates the heat of the sun and the cook pot is placed at the focus of the parabola. This is a great use of sustainable energy, it keeps the air cleaner (by avoiding open fires inside huts), and saves women from the backbreaking and time-consuming task of gathering firewood every day. Let's look at some of the math behind this problem. We only need to let t take values from 0 to 2π (otherwise we just "paint" the surface more than necessary) and r takes values from 0 to 5 if our aim is to create the same curved surface as shown in the above graph. Let's get back to the original problem. We want to create a spiral around the surface of the paraboloid. We modify the earlier parametric equations to get a curve rather than a surface, like this. We no longer create a surface with this expression. Instead, it will be a curve. As the variable t takes various values starting from t = 0, it generates a spiral around the 3-D surface. Let's see how, starting with a simple case. The graph of this is part of a parabola, starting at (0,0,0) and extending to (20,0,400), as shown. What is the length of this simple curve? We use a result from calculus, which is based on the Pythagorean Theorem. Also, in this example we have the end point t1 = 20. This seems quite a low firgure for the length, since the z-value at the end of the curve is 400, and going around the curve should add more than just over 1 unit to the length. However, the above graph does not have equally-scaled axes, whereas the following one does. We see that a parabola is "almost" straight, and a curve length of just over 400 for this curve is reasonable. Let's now see the effect of those trigonometric terms we saw before. (20 cos(20), 20 sin(20), 202) = (8.162, 18.259, 400). The arms cut the x-axis evenly at 2π = 6.28, 4π = 12.57, and 6π = 18.85. You can see the curve ends near (8, 18) as we claimed before. Now to examine the solar cooker problem. Substituting (25,45) gives us . from t = 0 to t = 45. The curve starts at (0,0,0) and the top point is (23.6, 38.3, 45). We see there are about 7 spirals. How do we get more or less spirals? We have around 7 turns in the above spiral, but we may need more or less. If we want to achieve more spirals within the same x-, y-, and z-constraints, we need to multiply the variable within the trigonometric terms by a number. This has been an interesting application of math where 3-D geometry and integral calculus are being used to examine a good use of solar power. We need to make more use of the huge amount of energy available from the sun, and solar cook pots are a great way to do so. A very useful and interesting article for practical applications. Thank you. Isn't there a dt at the end for the curve length integral? @Mahesh: Well spotted! My examples had the "dt" but the 2 general formulas did not. They do now. Thanks for the feedback. I am looking through your post and a number of the image equations are not showing up in the browser. I am using Firefox 50.1.0. @Troy: Thanks for alerting me! It was a problem on the server end, not with Firefox. I've fixed them now. @Murray, no problem! Excellent article. I have a question, what purpose did Magnar have in wondering what the length of the string traced around the paraboloid would be? Was it simple curiosity or was there a practical purpose? I have read the article a couple of times and it doesn't seem to be mentioned. The reason I wanted to see the equations is that I am working on a similar problem, the string tracing around a conic spiral. Specifically I wanted to build an LED strip christmas tree controlled by micro controllers and I needed an estimate of the strip length wrapped around the tree (cone). 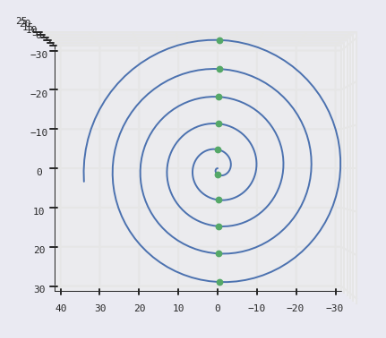 I went off on a tangent and worked out the integral for arc length of the spiral given a particular height and generated a bunch of computer code. What did you use for solving the integrals? I used http://www.integral-calculator.com/ to help me with the derivation and python for the implementation. The solution to the integral is involved and comments are not the correct place for it. The length that I am getting seems to be reasonable but I would like to confirm that I did it correctly and didn't miss anything. 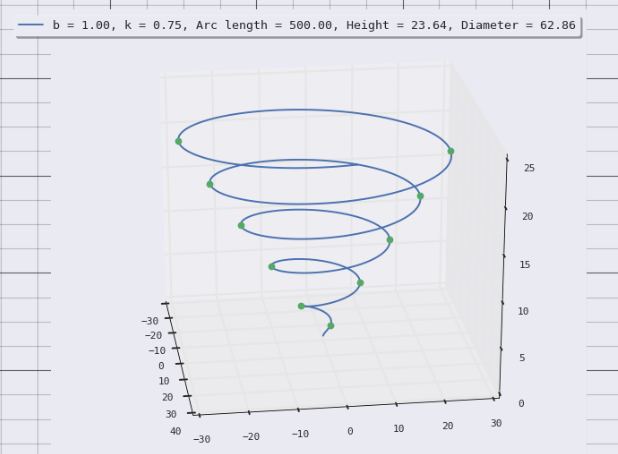 Would you know of a way to approximate the solution as a check for a 3D spiral? Magnar was interested in making a spiral solar cooker (see this 3D sketchup). Using your formula I got the spiral length to be , which tallies with the result when using your first (more fundamental) formula. There are about 8 spirals and looking from above, the gap between each spiral would be about 1/8 = 0.125. This tallies with from your statement. Hi Murray, I appreciate your help! It is fascinating that Magnar is making use of the spiral line in the fabrication of the cookers. From the 3D model it looks as though the spiral is scribed onto the pieces of sheet metal. Once the sheet metal is cut it can be properly assembled into the solar cooker. What a fantastic practical use of mathematics! Initially I thought that the spiral problem was a bit of a tangent for me, but like so many things it was quite a pleasant diversion. Thank you for confirming. I can use the absolute value of the y coordinate as a radius of a half circle. We can sum all the half circumferences (pi*r) and arrive at an approximation. When I did it it was pretty close. I suspect that for larger spirals the error will increase. I haven't heard of Scientific Notebook before, it looks interesting. I have used Wolfram Alpha to help with solving the integral. I tend to use a mix of python and Jupyter Notebooks. Jupyter is very similar to Matlab, except open source. instead of in section "The arc length for a 3-dimensional spiral". @Anthony. Actually, the variable is , not . Sorry for the previous comment. I was the one who made the mistake. Forgot to square the whole derivative. I am now trying to draw a spiral on a flat sheet of paper to fold/bend it and create a paraboloid approximation. Here is where I got. 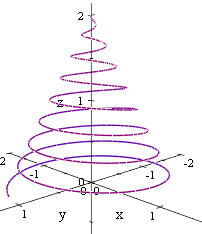 Now lets take a xOz plane and start rotating it 20 degrees by 20 degrees and cut the 3D spiral. 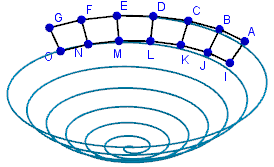 Every 20 degrees I trace a spoke in the plane between 0 and the intersection of the plane and the spiral. Now I want to trace those spoke on my flat paper. If I trace them every 20 degrees when I will bend the paper they will not be on my planes. And here I am stuck since I do not have the function R in function of alpha but theta. Do you have any idea on how I could continue? I guess another approach is to produce a ribbon (rather than a spiral) whose width would vary. The top of the paraboloid would be quite neat, but the vertex may be a challenge.